Facebook Inc (NASDAQ:FB) was a notable decliner during Wednesday’s trading session declining by 1% on relatively high volumes, which were 0.9 times the daily average. The stock has been in a massive uptrend outperforming the broader sector over the last couple of years. 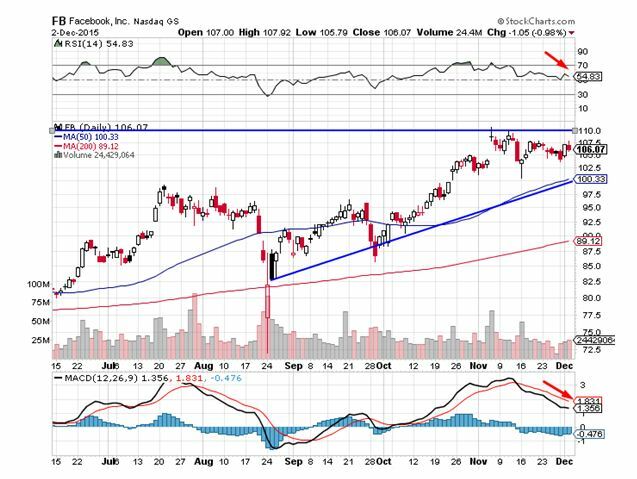 Facebook has been forming higher tops and higher bottoms but is currently facing resistance at levels of $109.57. Traders believe the stock could find support at levels of $102. The index, which measures relative strength, has formed a lower high, indicative of the strong bearish presence at current levels. The MACD oscillator has given a sell signal. A group of new startups have decided to leave the old-fashioned way of determining credit worthiness through credit scores and replacing it with Facebook profile analysis. These firms are changing the way credit is assessed by adopting a more modernized approach that involves social networks rather than using the conventional credit score rating. The new method involves a careful analysis of the applicant’s social profiles. The startups also include other criteria such as the frequency of cell phone use and how often they sent text messages. The companies that use this kind of an approach argue that considering such information allows them to determine a person’s creditworthiness much more effectively. They often carry out an analysis of their lifestyles, how they mingle with other people and the decisions that they make. If the firms are satisfied with the results, the funds are immediately transferred to the loan applicant. These companies limit their loans to less than $1,000, but some of them would like to increase the limit once they gain a wider customer base as well as a completely established credit worthiness of the customers. The downside of obtaining such loans is the high interest rates that are due to the high level of risk involved in these credit services. One of the firms that use such methods is a company called Affirm that was founded in 2013 by Max Levchin, co-founder of Paypal Holdings Inc (NASDAQ:PYPL). Some of the checks that Affirm goes through in social networks might sometimes seem irrelevant. Mr. Levchin, however, stated that there is a lot of data that is retrieved about the clients and a lot of that data is relevant. Affirm’s strategy is similar to the strategy used by other startups where they try to appeal to the younger generation that often has very little trust in banks but still wishes to secure finances. Levchin particularly targets college graduates who need finances to secure an apartment and other fundamentals. ZestFinance is another firm whose strategy involves the use of big data to determine credit worthiness. The company relies on information about mobile phone and social network use. It analyses credit variables through technology usage. Its main target is the upcoming markets.